Dr Andrew Wakefield is a vaccine researcher who found several cases of inflammatory bowel disorder and regressive autism in children who had received the triple jab - the mumps, measles and rubella vaccine before falling ill. Wakefield, together with other researchers, published a paper in The Lancet, describing the cases and calling for further investigation. The tentative recommendation that came from the case stories was to return to single vaccines, which had not given the problems seen with the combination. The reaction was swift and severe. Having committed itself to support the triple vaccine by underwriting the payment of any damages that might be awarded to parents in court, the British government did not look kindly at the information that was coming to light. The General Medical Council (GMC) was called in to chastise the researchers. Brian Deer, a journalist writing for the Sunday Times, and working with a GMC linked investigative group, provided the excuse with a frontal attack on the researchers' ethics. None other than the then Health minister John Reed asked that the information in the article be used to make a formal complaint to the General Medical Council so proceedings could be started against the researchers. The case has been dragging on for years, but is was effective in discrediting the original research and the researchers in the eyes of the press and the public - to save the reputation of the "triple jab". Parents of vaccinated kids have been defending the researchers. They see their kids ill after vaccination and would rather the research continued to find out what happened. The hearings in the case no longer make good copy for the newspapers, but reports are available on www.cryshame.com. The prosecution's case in the "fitness to practice" hearings against the researchers targets the messengers, rather than listening to the message. In a paper entitled 'Isolation and Identification of Measles Virus in Cell Culture,' the US Government's leading virus research institution, the CDC, laid out how isolation of this virus should be done. It instructs; first obtain from a patient suspected of having measles a small sample of urine or fluid from the nose or mouth. Next, taking care to use rubber gloves and splash goggles, add a toxin called trypsin. The CDC warns to expect some of the cells to fall away as if they are poisoned. They are. It then instructs: add nutrients and glucose and leave the cells alone for two or three days so they can recover. Next, add to the cell culture the sample from the patient and place the culture in a warm incubation chamber. After an hour, inspect its cells with a microscope to see if any are rounded, distorted, or floating free as they were immediately after trypsin was added. 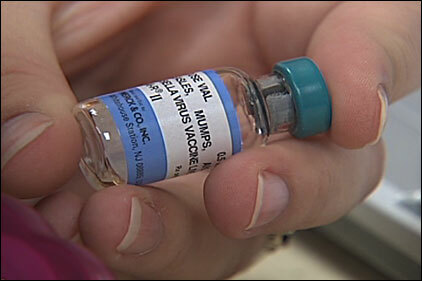 If they are, the CDC calls this proof that measles virus is present and causing this illness! Why, when toxic trypsin has been added and the cells were already ill? But the CDC has no doubts. It instructs; if 50% of the cells are now distorted, the cell culture is to be put in the fridge as an "isolated measles-virus stock!" This will contains many particles and toxins from these extremely sick monkey cells � yet it is said to be an 'isolate' of measles virus that might be used for a vaccine! In fact, no measles-like symptoms were looked for in the culture. The CDC does not even look to see if the measles virus is present. It is the fluid filtered off from such an incubator that is used as a vaccine. When I read this paper, I was horrified by the inadequacy of the science. The child vaccinated would have to produce many antibodies against all the contaminants � irrespective of whether they were measles virus. This led me to wonder how this virus was first discovered and processed to make measles vaccines. I hoped it would be nothing like the faulty process used with the polio virus. But I found that John Enders, the scientist who developed the measles vaccine in 1954, said he had modeled its development on the work he had done to help make the polio vaccines. His team had obtained some fluid, 'throat washings and blood', from an 11-year-old boy with measles called David Edmonston. When this was added to 'human post-natal' cells in his lab, these cells fell ill. This he took as indicating a measles virus might be present. This fluid was then added to human cervical cancer cells (HeLa) and to 'human carcinoma cells.' The cells became still sicker. Fluids from one culture then were moved to another and then to another With the microscope revealed `giant multinuclear cells' had appeared in the cultures (much as Robert Gallo noted with his 'HIV' culture), Enders took this as a sign that the measles virus had distorted them, not that the cancers might be getting more malignant. When they tested the resulting cell culture fluid on Cynomologus monkeys, they found some got a 'mild' illness that in 'some aspects resembled measles.' Enders took this as evidence that this toxic mix of mutant cells was a measles virus `isolate.' He called it the 'Edmonston isolate' after the name of the boy. At this stage this was certainly not purified or truly an isolate. So - what does this mean for the measles vaccine? To be sure, there is no lack of stories in the press and on the internet accusing Dr Wakefield of everything from scientific misconduct to profiting from work with lawyers of parents who were getting ready to sue the vaccine manufacturer. I won't link those here, but you can find them by simply googling "Wakefield MMR". Louise Mclean spoke to Martin J. Walker in late August about the GMC trial of Dr Andrew Wakefield. The hearing has already lasted for more than a year and is not scheduled to finish until April 2009. Anther link to Martin Walker's essay: An Interest in Conflict? British journalist Brian Deer of the Sunday Times is the point of origin of a witch hunt against three scientists who reported on cases of children that fell sick after MMR vaccinations with autism-like symptoms. In the attempt to discredit Dr Wakefield and the other defendants, the prosecution, employed and paid for by the GMC, has suggested that none of the children referred to the Royal Free Hospital were actually ill. In order to support this suggestion, they have had to ensure that none of the parents of vaccine damaged children appear at the hearing. Meanwhile, in the background, Brian Deer has mounted significant attacks on these parents, accusing them of manufacturing information about the illnesses suffered by their children, and about its cause. Deer's new attack on Dr Wakefield is equally an attack on the parents and children who sought treatment at the Royal Free Hospital and represents a new low for British journalism. The parents of vaccine damaged children will not be silenced and research into possible causes and treatments will continue. Members of the public, parents, doctors and scientists worldwide are now calling for a formal enquiry into the activities of Brian Deer, the Sunday Times and their connection and co-operation with the vaccine industry.